A 2015 work by artist Thomas Kelly ('97, A.F.A.) 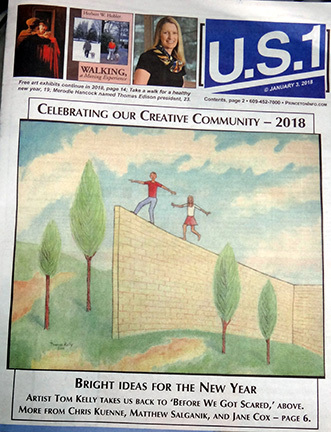 was featured on the cover of the Jan. 3 edition of US 1 newspaper. The painting" Before We Got Scared" is a 24" x 30" acrylic on canvas. Kelly's book, "One Hundred Rules of the Aspiring Painter," will be published in the spring and will include numerous illustrations from his considerable body of work. Artist Thomas Kelly Photo. Photo courtesy of Bethlehem House Gallery. 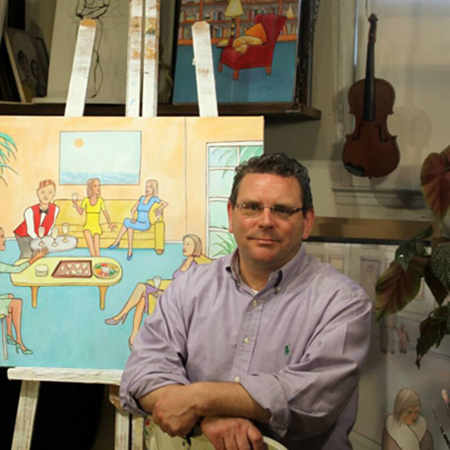 West Windsor, N.J. – Mercer County Community College (MCCC) alumnus Thomas Kelly '97 (A.F.A., Visual Arts) continues to produce highly popular, signature acrylic paintings that are embraced for their color and intriguing narratives. More than 250 of Kelly's works are in public and private collections to date. At this stage of his career, Kelly has learned a lot -- about the making of art and the business of art. He has decided to share that wisdom in a book set to come out this spring. Kelly's “One Hundred Rules for the Aspiring Painter” will be published by Firehouse Publications (Bordentown). US 1's Preview Editor Dan Aubrey took note of Kelly's book, with the newspaper featuring one of his works, Before We Got Scared, (2015) on the cover of the Jan. 3 edition. Inside the paper is a preview of the book, in which Aubrey lists 12 of Kelly's words of advice. (There are 88 more!) Read the article here. The award-winning, Hamilton-based artist says the advice he compiles in the book arose from his artist talks. "When I was first asked to do talks, I wanted to be prepared. I wrote an outline with some basic guidelines that I follow. This evolved into an amalgam based on my own insights and experiences," Kelly explains. With an upbeat approach that blends classroom and street smarts, the book is organized into five sections: Composition, Control (technique), Color, Contemplations (how to think) and Civilities (how to act). "I wrote the book with brief, simplified information that is readily understandable and easily digested. I want the advice to be simple to understand like my paintings, with the same honesty and emotion," Kelly says. Among his dos and don'ts are: Be yourself; Be tenacious; Don't be perfect; Trust yourself; and Grow a thick skin. Each of the 100 rules will have a Thomas Kelly painting or drawing to illustrate it. He is currently finalizing the selection of the illustrations and formatting of photos that will be included in the book. Kelly says Firehouse Publications is a small arts education oriented company that aligns well with the his material and goals. Even while pursuing his busy art career, Kelly continues to work as a manager at KNF Neuberger, an international company that manufactures environmental monitors, medical devices and lab equipment. "Having a job outside of the art world somehow allows me to focus on my art more, in the time I have to work. It has given me discipline with my time and also allowed me to paint whatever I wish, not try to paint what I think will sell," he says. Kelly continues to express appreciation for the formal training, encouragement and support he received as an MCCC art student. " I give a shout-out to Mercer's Fine Arts Program," he said, recalling the boost he felt when that he was selected for the MCCC Fine Arts Award and the purchase of one of his paintings by former professor Ann Bobo. "Ann inquired on graduation night if a certain piece was available. I was walking on air. Imagine, a professor at the college purchasing a piece of mine. Wow!" he says. Having mentors, champions and supporters is a point Kelly addresses in the book. "The best artist in the world cannot do everything themselves. It is truly a team effort. That is why I say 'we' a lot, instead of 'I.' There are a lot of people involved in the career of a successful artist." Kelly's paintings are available for viewing and purchase at The Artful Deposit in Bordentown, Bluestone Fine Art Gallery in Philadelphia and Bethlehem House Gallery in Bethlehem, Pa. For more information about Kelly and his art, click here.